In our weekly study, I had two women who became friends with each other. After attending a few months, these women got together and went to one of the church administrators and told lies about me. They told them that I was trying to use this group to start my own church without the sanction of our leadership. My husband and I were called into the Pastor’s office and we were treated very rudely. The ministry did not handle it well and we were asked to resign from our position. I was shocked. I left the meeting frustrated because I felt that God had placed me in this position and through this ministry people were being blessed and growing in Christ. At the time, it really hurt. I was so angry. I had fed these women and cared for these women and for them to betray me was almost unbearable. The ministry didn’t want to be bothered with the whole affair. There was no way to prove that I was innocent and the ministry could not afford to have someone in my position to run off with a bunch of people and cause a split in the church. They chose the safe option and took away any power I had to endanger the church. I went through two or three years where I struggled. One day, I was in church and I looked at my Pastor and the same frustration came over me. Why couldn’t he believe me? I began to pray that God would change my pastor’s heart. Then I felt God’s anger but it wasn’t at my pastor it was at me. God said to me. “Who is this man that you think has power over you? I have all the power. It is at My will you are raised up and at My will you are brought down. This man has only the power I give him. Submit yourself to Me. Submit to what I will ask of you whether it be in in the sun or whether it be in valley of the shadow of death. Submit and trust in My Will where ever it may lead you.” That day, I wept and repented for trying to save myself and I told God whatever He wants, I will do. I do not know the plan of God. I did know that I would no longer look to my Pastor for approval. I had to look to God. I forgave my pastor and those women because I understood now that God wanted me to submit to whatever I would have to face in ministry and I was God’s servant. I truly submitted. I had been using this big church with over 1200 attendees to hide from the hardships of true ministry. I was dazzled with the prospect of being accepted by thousands. I was a worship leader for evening service on Sunday Night and a pianist for two bands during the Sunday morning and Saturday night services. I was teaching in the women’s ministry on Saturday mornings and even spoke at a women’s conference. I was high on the glamour of being received by thousands instead of submitting to the idea of serving outside to the lost, the poor and the broken hearted. I was inside church but I had abandoned Christ’s true ministry. For quite a while my parents and my sister had wanted to do a Bible Study in our home on Sunday afternoons and I had scoffed at the idea because I was too busy. There was no glamour in it. After God put me in my place, I agreed to do the Bible study. I realized, I was like Jonah running from the real work God wanted me to do. I had been doing this for years. After two years, through this Bible study on Sundays, a church was started in Tacoma, Washington through the Global Network of Christian Ministries. It was the organization my parents and my pastor belonged to. Now, that church meets in a community center and our ministry sponsors our Kid Center and a free meal program for underprivileged children. Our Ministry also sponsors and supports the Tacoma Metro Parks South End Neighborhood Community Center. After a couple years, my pastor resigned his position and he and his wife moved out of state. The new pastor has embraced our work and has even given monetary support. We belong to the same christian organization and when I last saw my old Pastor, it was on equal ground as ministers at a conference held by the organization we both belong to. I have forgiven him and he was very friendly and accepting when he approached us. The greatest opportunity in church is the opportunity to minister to others. The unforeseen benefit is the opportunity for Christ to help us develop our character. Remember gold must be tried in the fire and character is built through adversity. Our instinct is self preservation but self preservation is based in “self” and with God “self” must be laid at the altar of sacrifice. Your ministry can only be developed like Christ developed His. Christ’s ministry was among the people. This requires submission that you yield yourself to the opposition for the sake of your ministry among the people and do not run away. We will know Christ in the fellowship of His suffering and He came unto His own and His own received Him not. The greatest hurt Christ had was to love unconditionally in as much that He laid His life down for those He loved, only to be betrayed by them. Everyone of us must face our Garden of Gethsemane like Christ did. We must make the decision to submit to the cross. Our cross is the sacrifice of ourselves for the greater good of God’s plan. We sacrifice ourselves when we open up and let God use us for His kingdom and it requires that we allow ourselves to be exposed to the most unspeakable acts of unkindness in exchange for the opportunity to minister to those who will also betray us. 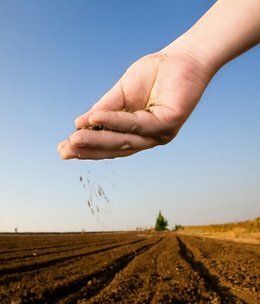 There can be no ministry without Christians who have the stomach to rise above the “weeds” and make a difference. Embrace adversity. Like the old slogan says “Let go and Let God”.